One of the most important names in medieval architecture in the Netherlands is that of the Keldermans family, of which seven generations were architects and sculptors, especially working in the Brabantine Gothic style. Originally named Van Mansdale, the family originated from Brussel and later settled in Mechelen. Both these cities were among the most important of the Duchy of Brabant and are now in Belgium. Although much of the family's work was in the Duchy of Brabant, they had several assignments in Holland and Zeeland as well. This page deals with their work in the current Netherlands only, and is incomplete. Jan I (ca. 1345-1425): sculptor. No known work in the Netherlands. Jan II (ca. 1375-1445): son of Jan I. Best known as an architect. 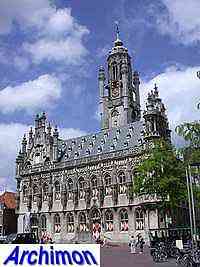 Became town architect of Mechelen (Belgium) in 1427. Andries I (ca. 1400-1488): son of Jan II. Worked as a sculptor and succeeded his father as town architect of Mechelen. Rombout I (ca. 1420-1489): son of Jan II. Worked as a glass painter. No known work in the Netherlands. Jan III (unknown): son of Jan II. Worked as a sculptor in Gouda and Middelburg. Matthijs I (unknown): son of Jan II. Worked as a sculptor in Leuven and Middelburg. Antoon I (ca. 1440-1512): son of Andries I. 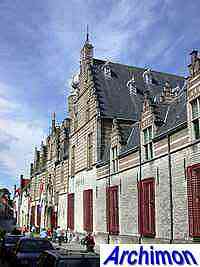 Cooperated as an architect with his father, who he later succeeded as town architect of Mechelen. After 1476 town architect of Bergen op Zoom. Also known as Anthonis I.
Matthijs II (unknown): son of Andries I. Worked as an architect and sculptor. Laurens I (unknown): probably a son of Matthijs II. Sculptor. No known work in the Netherlands. Antoon II (unknown-1515): son of Antoon I. Succeeded his father as town architect of Mechelen and later became court architect of emperor Charles V. Also known as Anthonis II. Rombout II (ca. 1460-1531): son of Antoon I. Town architect of Mechelen and head court architect of emperor Charles V.
Laurens II (unknown-1534): son of Antoon II and successor of Rombout II. Probably the first to use Renaissance influences. Marcelis (unknown): builder of fortifications. Gothic church. By Andries I, later by Antoon I and Rombout II. Town hall in Brabantine Gothic style. By Andries I, later assisted by his son Antoon I. Sculpture by Matthijs II 1495. Damaged by bombs in 1940 and rebuilt later. Town hall in Brabantine Gothic style. 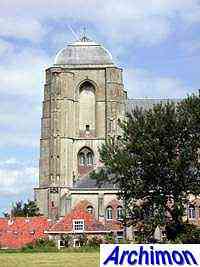 By Andries I and his son Antoon I.
Cruciform basilican church in Brabantine Gothic style. By Andries I, assisted by his brother Matthijs I and his son Antoon I. Unspecified work by Andries I. Unspecified contributions by Andries I to the town hall designed by Everaert Spoorwater. Late-Gothic cruciform church. By Antoon I, after 1512 by Rombout II. Unfinished, and mutilated later. 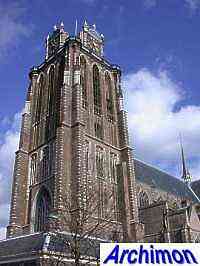 Church started in 1462 by Everaert Spoorwater. Portal by Matthijs II. Church completed by Laurens II. Extensive rebuilt of the marquis' palace by Antoon I, his brother Matthijs II and his son Rombout II. Complex in late-Gothic style, with chapel. Plan by Antoon I to replace the older church by a bigger one. Work didn't start until 1504, when the construction began of a second transept with side-aisles and a three-sided choir with ambulatory. The rest of the plan was abandoned. Antoon I takes over this project from Cornelis de Wael. The stone tower proved to be too heavy and was already demolished between 1514 and 1517, only a part of it remaining as the foundation for a new wooden tower. By Antoon I. 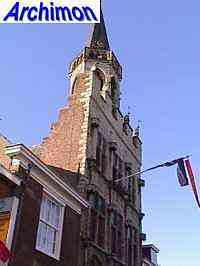 Tower in Brabantine Gothic style. Only the lower half was finished. Extensive rebuilt of an older church. Plan by Antoon I was to result in a natural stone cruciform basilican church in Brabantine Gothic style. Only the northern transept arm with chapel and side-choir were finished, the transept arm probably having been designed by Rombout II. 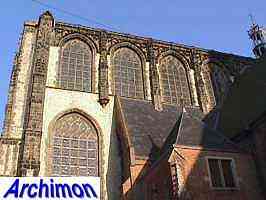 Enlargement of an older Gothic church. By Rombout II. Demolished in the 19th century. Castle, designed by Rombout II by order of emperor Charles V. Unfinished and demolished later. Tall square castle tower. By Rombout II. Probably by Rombout II. An unfinished church, originally started in 1468, is completed, with especially the interior being in Brabantine Gothic style. In the late-19th century the church was lengthened. Keldermans' intricately decorated facade was rebuilt a few metres to the west. Late-Gothic town hall. By Rombout II.